June 2017 update: TxDOT plans to start construction later this summer. The city plans to upgrade the water and wastewater lines, since the area is under construction anyways. 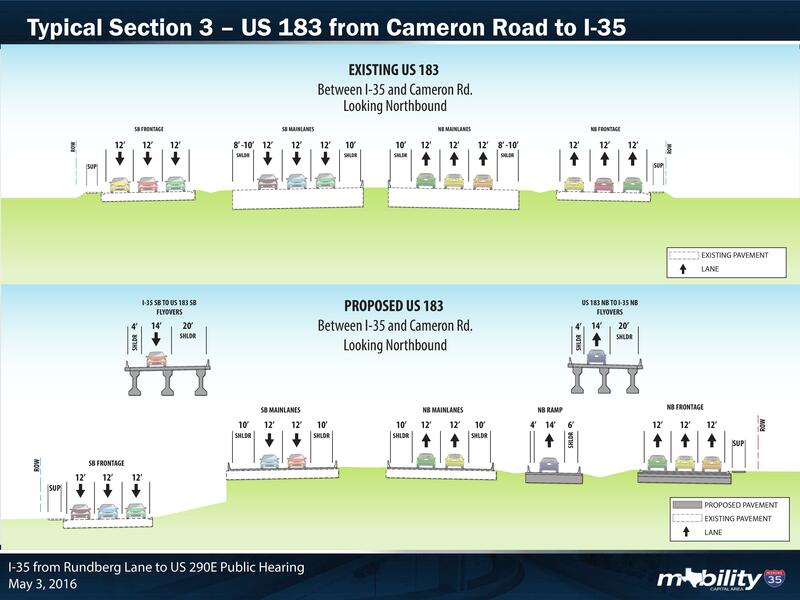 TxDOT is in the final stages of deciding on a project to improve I35 from Rundberg to 290, including expansion of the access road in Georgian Acres and adding flyovers at the I35/183 interchange. The U-turn at Rundberg would be widened for large trucks, and extended south. Sixteen-foot sound walls would be considered for areas around Middle Ln, Avesta Solano and Capella, Woodland Heights, and motels and businesses around Powell and Wonsley. The Cedars International area would also be affected by increased noise. A flyover would be added from southbound I35 to northbound and to southbound 183. This means that traffic would not have to exit the interstate, stop at the light, and then turn, as it does now. This should reduce traffic on the access road and improve our air quality. The southbound access road near 183 would be expanded to five lanes, with an 8- to 12-foot shared use path for bicyclists and pedestrians. For right-of-way, TxDOT would need to acquire one building at Towne Oaks, much of the University Inn property, and the area used for school bus access at the Republic of Texas museum. Federal law requires that the tenants who are displaced, permanently as well as temporarily during construction, be provided relocation assistance. Contact Daniel at Austin Tenant Council if are a resident concerned about your displacement. This entry was posted in quality of life, transportation. Bookmark the permalink.